If you need your child's old medical records from the Chrestnut St office, you will need to stop by the Fairview Comm Health Center on 7th Ave and sign a release of records. Some individuals are genetically prone to getting kidney stones, about one in 10, which is a lot of people, and they are the ones that will benefit from this Health-byte. The rest of the population do not get kidney stones, so this advice may not pertain to you. Most kidney stones are made of calcium oxalate, formed by the joining of dissolved calcium with dissolved oxalic acid (or “oxalate”) in the urine flowing through the kidneys. This forms the new compound of calcium oxalate which cannot dissolve, so it clumps up and forms tiny rocks in the tubes of the kidneys. These rocks collect more and more calcium and oxalate filtering through the kidney, making them grow larger until the stones get dislodged and fall into the ureter. The ureter is very sensitive, and a jagged rock can cause excrutiating pain as it scrapes its way down to the bladder. If you have a kidney stone, your doctor will analyze it, to see if you have calcium stones or a different type. Initially doctors recommended that people with calcium stones cut back on calcium to prevent kidney stones. Unfortunately, this makes it worse because calcium helps to remove oxalate from the intestines before it can enter the body. Also your body needs calcium for good bone and muscle health. The real villain is the oxalate, so reducing the amount of oxalate in your diet can actually prevent kidney stones. Oxalate is in many foods, so you need to know which foods are the highest in oxalate, and balance your diet accordingly. Most foods have only traces of oxalate, which is not a problem, especially if eaten with calcium containing foods such as milk, other dairy foods, eggs or green veggies. Some foods have moderate amounts of oxalate, and should be eaten only rarely. 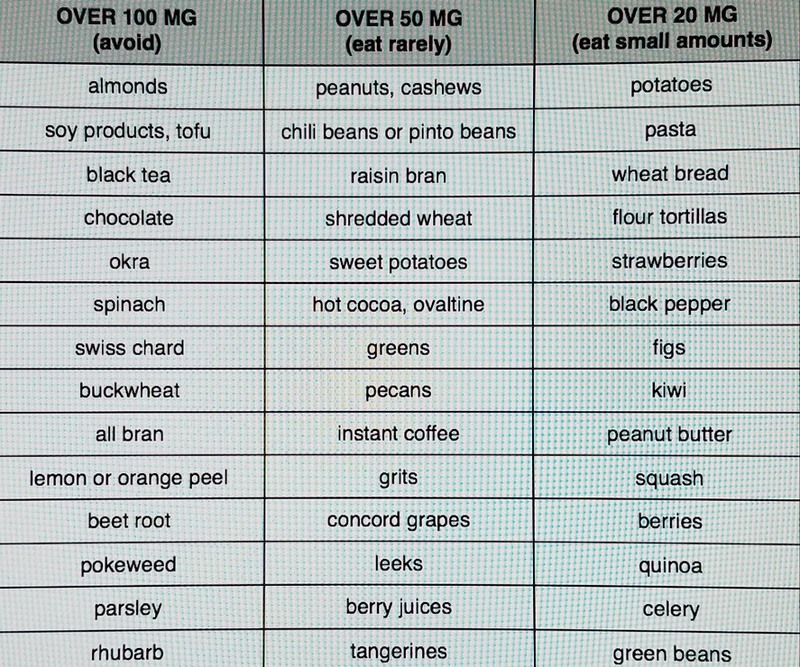 There are many lists of oxalate containing foods on the internet, and a short list of common foods is provided in a chart below. A few foods are super high in oxalate, and basically should never be eaten if you are prone to kidney stones. The major oxalate-rich foods are nuts (especially almonds), black tea, spinach, swiss chard, rhubarb, and soy products. These should be avoided completely. It is also important to drink plenty of water every day to keep the concentration of oxalate in your urine very dilute. This keeps unavoidable calcium oxalate from sedimenting onto any tiny stones that may be forming and making them into big ones. Drink 3 to 4 large glasses of water per day.